Anyone who is interested in public health may also be interested in the recent rash of new information graphics that attempt to portray various global health issues. While graphics often provide an easier way to understand an issue for many readers, it is wise to question the sources of information as well as how the graphic is portrayed. Simple graphics, such as maps based upon statistics, often provide the easiest way to view information. But, as you’ll see from the 17 intriguing infographics about global health listed below, some artists may go overboard in their comparisons and images. A Global Look At Women’s Attitudes Toward Domestic Abuse: Nothing makes it OK for a husband to hit his wife, but for some reason there is a large percentage of women that think it is somehow acceptable as shown in this graphic from Global Health Magazine. The U.S. is not represented on this graphic. Adult Prevalence of Smoking, 2005: This map, produced by the Henry J. Kaiser Family Foundation, shows that the heaviest smoking populations reside in northern Europe and Asia, with North America coming in third at 16-32 percent of the population. The lowest number of tobacco consumers reside in South America and Africa. Burning Fuel: While the focus is on the U.S., this graphic makes an interesting comparison to fuel consumed by cars and humans. The graphic teaches information about calories, energy and gas consumption, all eye-openers to those who may not realize how much they feed their cars AND their bodies. 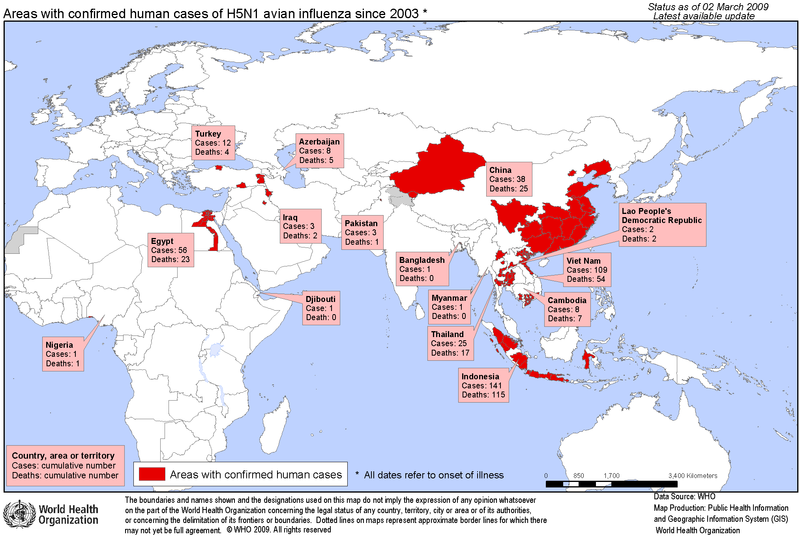 Confirmed H5N1 Avian Flu Cases since 2003: This map shows the countries, area or territories that have hosted individuals who contracted the H5N1 Avian Flu since 2003. The largest number of cases occurred in Indonesia with 141 and 115 deaths, followed by Vietnam with 109 and 54 deaths. Glass Half Empty: The coming water wars are documented by this graphic, which shows that only 2.5 percent of all water on earth is fresh. National rivalries over fresh water could harbor “the seeds of violent conflict” according to UN Secretary-General Kofi Annan in 2000. In the past 50 years, over 1,831 water-related interactions occurred between countries, and the vast majority ended peacefully. 21 involved actual military violence. Global Health Indicators: The World Health Organization (WHO) released a report revealing some encouraging signs of progress in world related health issues over the past 10-15 years. While this article points to the positive, look at how America fares in healthcare costs (highest) and how Africa fares across the boards, as the latter country lacks improved sanitation, access to health workforce and has the lowest life expectancy at birth. Global Mortality: This graph exposes a select comparison of leading causes of death for the years 2004-2030. Non-communicable diseases, such as heart disease and stroke remain the number one killers, followed by communicable diseases such as HIV/AIDS. Our Favorite Drugs: This graphic shows that pharmaceuticals pose the greatest dangers to communities, over marijuana, methamphetamine, heroin and cocaine. In 2007, 13 percent of all arrests made in the United States were drug-related. Progress Against Polio: This animated graphic shows that in 2008, only four countries in the world remain polio-endemic. These include pockets in northern India, northern Nigeria and along the border between Afghanistan and Pakistan. Scientific Evidence for Health Supplements: This graphic shows all the popular health supplements currently on the market, and whether or not they contribute to the health of an adult who eats a healthy diet. Tops on the list include folic acid, green tea, omega 3, vitamin D and St. John’s Wort. Share of General Government Expenditure Spent on Health Care: This map shows the global picture of how much money governments worldwide spent on health care in 2006. Most of North America and Australia top the list, with India ranking as one of the countries at the bottom of the list. Strategic Implications of Global Health: Two graphics on this page show the health care capabilities in countries across the globe outside the U.S. The second graphic shows projected deaths by cause for high-, middle- and low-income countries. This article also provides links to the full report on these topics. The Fries that Bind US and The Magic Bean Shop: A visible representation of McDonald’s and Starbucks. McDonald’s has over 31,000 restaurants in 118 countries and, currently, the lowest ranking of any other fast food chain in customer satisfaction. Starbucks connects some of the poorest countries in the world with the richest through its use of coffee beans, milk, sugar and paper cups. They have 6,200 stores worldwide with three new stores opening daily. The Global Obesity Problem: This map shows the obesity problem worldwide, with the U.S. topping the list at 30-40 percent of the population over the obesity scale. Canada, parts of South America, Australia and Western Europe follow, with India being one of the lowest ranked countries for obesity. World Health: The end goal for most countries in the world is to keep citizens healthy at the lowest possible cost. This graphic looks at 12 countries around the world that examine how far the money they spend goes toward affecting their citizens’ health. The U.S. spends about $2,500 more than Norway to treat approximately the same number of people. World Hunger by the Numbers: Almost one in six people in the world suffer from lack of proper food. Two out of three of the world’s hungry live in seven countries, including India, Bangladesh, Indonesia, Pakistan and China. But, at the same time, one in eight Americans receive food stamps, and 3.2 million of those recipients reside in Texas. Wyoming holds the lowest number of food-stamp recipients at 32,000. This entry was posted in Global Health, Resources and tagged abuse, infographics, obesity, polio, smoking, tobacco, world hunger. Bookmark the permalink.